Business development comprises a set of strategies, tactics, and actions to grow a business via a mixture of sales and marketing. Indeed, while marketing usually relies on automation to reach a wider audience, and sales usually leverages on the one-to-one approach to close complex deals. Business development is about creating distribution strategies to scale up a business. A good business development process should have as the primary aim to drive business growth with strategies, partnerships and unconventional marketing to 10x the output of the organization. The success of companies like Google also depended on their business development capabilities. Although you might be looking for a straightforward definition of what business development is, you need to understand that this is a discipline in continuous evolution, which has as a main driver business growth. In this context, a good place to start is to define what business development is not. Why does business development matter? What activities does business development imply? What actions can the business developer perform to improve the sales pipeline? Business Development is a mysterious title for a little discussed function or department in most larger companies. It’s also a great way for an entrepreneur or small business to have fun, create value and make money. Good business development allows businesses to profit by doing something that is tangential to their core mission. Sometimes the profit is so good, it becomes part of their core mission, other times it supports the brand and sometimes it just makes money. And often it’s a little guy who can be flexible enough to make things happen. The thing that makes business development fascinating is that the best deals have never been done before. There’s no template, no cookie cutter grind it out approach to making it work. This is why most organizations are so astonishingly bad at it. They don’t have the confidence to make decisions or believe they have the ability to make mistakes. Those words resonate with me as I found myself in the position of leading the business development of a tech startup. Business development can make your organization successful overnight if a proper deal is found. But searching and finding deals and executing them successfully feels like a gold rush. Therefore, to make business development work it is necessary to make it a process. The process needs to be focused on understanding how to drive value for your organization by leveraging on partnerships that can bring your business to the next level. Business development is also about how to leverage and tweak your existing business model to make it scalable. When Google closed the deal with AOL, overnight Google, a rising star, could be featured on the largest online portal. Before to move forward it is important to understand the difference between business development and sales. Thinking about the business developer as the sales guy, it’s limiting. 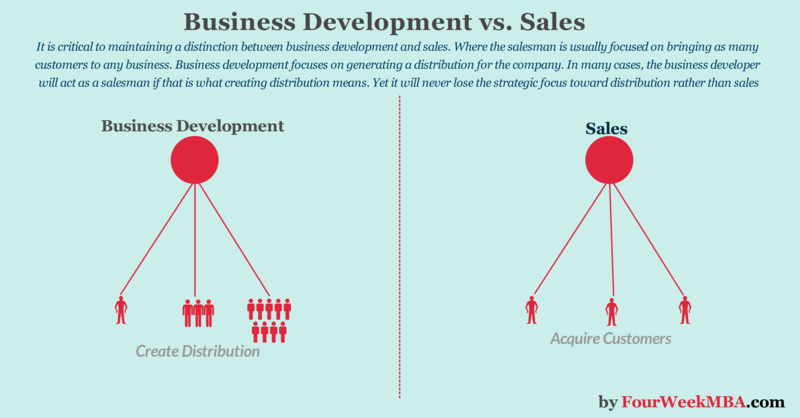 Not that a business developer doesn’t sell, but it does so by creating a distribution. In other words, rather than looking at the single sale the business developers try to find sales channels to tap into to speed up the process of scaling up a company. If that means selling a product or a service directly, then the business development person will temporarily become a sales guy. Imagine the scenario of a company that has no clients. In that context, a business developer will need to find the first clients as quickly as possible. Those clients will serve to launch the company’s growth, while the business developer will look strategically at ways to have those clients to become partners. Therefore, all of a sudden a few clients become your distribution channel. Even though the business developer acted as a sales guy from the outside, he never lost sight of the long-term strategy. Business development is a mixture of sales and marketing. In fact, in many cases, a business developer will use marketing and PR activities to establish critical relationships for the business. Those relationships will become partnerships to generate new distribution channels. Where the sales process ends up with a closed deal. The business development relationship starts with a closed deal. The business developer knows that a deal closed is just the starting point of a long-term relationship that can impact the business in the long run. Therefore, the business developer will translate that paying customer in a trusted partner, and an advocate for your business. Marketing automation is a powerful tool for any business. However, marketing automation is also risky. Indeed, automating processes requires a deep understanding of your customers. Thus, before you can automate the marketing processes, you’ll need the business developers to help the marketing team structure those processes. Indeed with unique insight about the company’s customers, the industry and competitors, the business developer will advise the marketing department on how to structure and set up automation processes that fit the long-term organizational growth. When Google closed its deal with AOL, it was a turning point for the tech company that would become a unicorn first and a tech giant then. It all started with a business development activity that allowed Google to build a partnership with AOL and kill its competitors! A successful business development person is a quick learner and a renaissance man. He will be able to learn about as many disciplines needed to have a deep understanding of the industry that will drive the company’s growth. For instance, if you think of a business developer in the digital marketing world, he’ll probably be someone that understands SEM, SEO, funnel optimization, content marketing, sales and all the other channels available to grow a business. The business development process could vary quite a lot based on industry, business model and stage of maturity of a company. If you are called as a business developer for a startup, most of the activities will be connected to grow the startup and bring it to the next stage of growth. Therefore, the successful business developer will need to have a mindset fine-tuned for growth. To be able to build a relationship quickly, a business developer has to understand the business dynamics of a potential partner. Indeed, just by tapping into the economics of a partner, the business developer can craft the perfect deal/solution. For instance, when Google proposed the deal to AOL, the deal was so good for AOL, and it had no risk for them, that they couldn’t say no to it. Yet AOL was an established network, which was what allowed Google to get into the next stage of growth and scale. Anything that helps build up a solid distribution strategy falls into the business development processes. A sales pipeline is as a visual representation of your sales process where all your potential customers are displayed and neatly arranged according to their phase in your sales cycle. A business developer has to be able to build up predictable sales processes to generate continuous streams of leads for the organization. The sales pipeline is a useful tool to set up those processes. Therefore, after you have qualified a lead, you have 1 in 10 chances of closing it. Once you have met, defined the project and sent a proposal, then your chances will improve up to 60%. The chances of closing a deal also depend on other factors. For instance, have you previously worked with this person? In short, if you have already built trust, it will be easier to close the deal. If you are expanding a project you were working on, then it might be easier as well. Therefore, it will depend upon several factors crucial to any deal. Yet the business developer can have clarity about the stage of a business deal. In that way, the business developer can plan the actions and activities that will get the sales process going. Why undertake a career in business development? Overall the balance is positive. Now the most critical question. How do you make a business get traction? As a business developer, you need to understand some of those channels to grow a business. LinkedIn is a fantastic tool to generate conversations that can help you speed up the prospecting phase. What can you do with LinkedIn? Check out the complete guide on how to use LinkedIn. Sales canvassing is a sales process where you get in touch with potential customers that have never heard about your brand. Examples of sales canvassing are door-to-door sales and cold calling. Those are critical strategies as they might be an inexpensive and sustainable way to generate qualified leads without having to rely on sales consultants or expensive lists. However, to be successful, the process of sales canvassing needs to be structured. As many new startups operate in the digital space, it is easy to assume that old sales techniques are also outdated. Thus, we all like to speak about marketing funnels, automation, and multiple touch points. However, any business to be sustainable needs a continuous stream of leads; and in many cases, this implies cold calling or approaching people that never heard of you before. Indeed, unless you have a massive marketing budget that you can use to grow your brand quickly. In most other cases you need a sales force that can venture in the world and create contacts with customers that don’t have a clue about you. However, to make the sales efforts effective you’ll need to make sure your sales force has a plan, a strategy and a process to follow. That is what sales canvassing is about. That is a process through which salespeople can have consistent results nonetheless of the single outcome. When you make the sales canvassing process yours, that is when your company can become sustainable in the long run as you won’t need to depend on other companies to provide you with a consistent stream of leads, you’ll be able to generate them on your own. Also, you’ll be able to grow a sales department able to create new opportunities independently from the marketing department. That doesn’t mean you’ll need only sales canvassing. In many cases, having multiple touch points with a potential customer via proper marketing strategies is a good strategy as it makes it way more comfortable for your salesforce to close a complex deal. In other cases, though it is also critical to have an independent sales force able to open up new opportunities, primarily when your brand isn’t yet established. When a salesperson ventures to bring in customers that never heard of your brand before, it becomes critical that the sales force is very knowledgeable about the product and service and they can explain it in the simplest terms. When approaching someone that never heard about your brand, why even focus on explaining who you are. Instead, focus on their issue and what solution you have for them. They need a short term pay off. Find out what is the payoff and struggle your potential customer has and propose a solution. That is when you’ll listen. During sales canvassing it is critical to have a laser focus. You need a list of contacts, but it makes sense to start from a profile that fits best the profile of existing customers your company has. Indeed, when approaching a customer that never heard about your brand, you’ll need to understand what problem you can solve. But she/he won’t trust you can answer it unless you showcase studies that resemble the situation they are in. When you can tell a business owner you’ve already helped someone in a similar situation it’s easier to trust you even if they never heard of your brand. When you take the time to understand the problem, propose a solution and show a similar case study that is when sales canvassing becomes way more effective. Many salespeople like to use scripts. Scripts are prepackaged dialogues usually drawn by old conversations with existing customers. While scripts are a good starting point, you need to be flexible. Indeed, with sales canvassing, you’ll deal with people that never heard about your brand and your company. Would it make sense to engage in a dialogue you had with a client that already knew you? Not really. During sales canvassing the risk of being rejected is exceptionally high. It is critical to allow your sales force to understand that is not something personal, but rather that is part of the process. Rejection is what makes them more effective. During sales canvassing, it is important to focus on a single channel. Therefore, if your preferred way is telemarketing, you’ll use the phone. However, not all customers like to be reached by phone. In that scenario, you’ll need to learn how to use several channels, from social media to emails. The important thing is to be able to generate a conversation for long enough that the person, on the other hand, trusts you can bring an actual value. When you get there, you won. Whatever medium you choose it is critical to have a process, with clear objectives, which is repeatable and where rejection is part of the learning process. In Marketing vs. Sales a cleared out the distinction between the two activities and when it makes more sense for an organization to leverage on marketing rather than sales and vice-versa. While it is essential to understand the difference between marketing and sales, it is also critical to understand how they work together. While marketing can get to the point of understanding the customer and make sales team superfluous – to a certain extent. The sales team though is a critical link between the marketing department and the customers. Salespeople are involved in the whole process of and customer journey at a personal level. Indeed, not only the salesperson might speak to the potential customer in the most delicate moment when she/he is deciding whether it makes sense to purchase your product or service. But it assists the customer throughout the entire process. For instance, a critical moment of the whole customer journey is when she/he needs assistance or support. While this phase might be in part automated, in most cases you’ll need a support team, which is often sales oriented to assist the customers. In those phases, you can unlock many insights about the customers that marketing will never manage to have with automation alone. That is when sales and marketing come together to create a customer-centric journey. In what other ways than sales and marketing work together? The usual funnel sees it the marketing department in charge of giving to the sales team a list of leads (people that might be interested in your product or service) they can work on and bring them in as customers. While this is the traditional process, it is important to remark that often the opposite happens. For instance, if you take the sales canvassing process that allows the company to acquire customers that have never heard about your brand. In that scenario, a sales team can give valuable insights to the marketing team on where to focus their attention and understand the areas where the marketing activities of the company might be improved. In the era of AI and machine learning, it’s easy to assume that automation should come before anything else. However, automation, if done with no coordination between the marketing and sales teams, it doesn’t add any value. If at all it can create irreversible damages to your brand. Therefore, before you set up any automation, you need a deep understanding of your customers, your product, your value proposition, and the whole journey customers take to go from the first touch point with your brand up to the referral stage and on. Thus, before the marketing department creates any automation you need them to coordinate as much as possible with sales team to make sure the automation process leverages on customer insights that only the sales force, which is in touch with the customer base on a daily basis – has at its disposal. Many believe that all you need is a viral marketing campaign to make the lead acquisition process smooth and inexpensive. However, even though viral marketing can do that, you might initially need intense coordination between sales and marketing (and engineering) to understand what part of your product might carry some virality. For instance, if you run a SaaS business in some cases, it might make sense to create a free version of the product (the so-called freemium model) that becomes an essential part of the lead generation process. However, what features, or how much volumes can you offer for free to acquire enough customers? A/B testing and big data will help. However, to set it up correctly you need insights from the sales teams. Those mentioned above are just some of the activities for which sales and marketing working together can really create an effective strategy for the growth of your brand and business. Therefore, even though it makes sense to understand and keep a clear distinction between sales and marketing so that each of them can focus on specific aspects of the business with accountability and set results. On the other hand, it is critical to understand the level of coordination that sales and marketing can achieve. Sales and distribution are two primary ingredients for any business success. Thus, starting from the best practices for your sales team is the first step toward building a profitable business. Of course, once you have mastered those the time is right to start experimenting with new sales strategies that none out there is doing. Yet if you’re missing the best practices, this is an excellent place to start. Salespeople have to act and do it as quickly as possible. Procrastination is the first enemy as the more time you spend thinking, the less you’ll have time to act and start for instance sending those emails that can lend you new clients or calling those contacts you have on your desk. However, to make your action more effective, a plan is needed. An action plan is merely a set of predetermined steps you will take and a workflow you’ll need to make your effort more organized. One key ingredient to make sales processes successful is the ability of the sales team to target the right leads. Indeed, imagine the case of a salesperson contacting a hundred people and closing none. In many cases that happens when the salesperson doesn’t know who’s the ideal target that can benefit from the company’s service or product. When a company has mastered lead generation by automating part of the activities from its marketing department it is easy to have salespeople forget about the first and hardest stage, get in touch with people that don’t know your brand. Instead, have your salespeople spend a part of their time doing sales canvassing or contacting with cold calls or emails people that don’t know your brand. When they master this process, they can also uncover insights about why your business didn’t manage to be recognized among valuable segments of the market as well. When a company starts up, you’ll probably have one or two salespeople that have a weird profile. In short, they are not typically just people that mastered the sales process; they are more like renaissance men and quick learners. They ventured in the business world when none or few people knew your brand and built the company from the ground up. Thus, those people know your company and product better than anyone else. Therefore, you don’t have to reinvent the wheel each time. Instead, have the new team members of the sales team take advantage of scripts that cover up the main concerns and questions potential customers might have and how to address them. Keep in mind that the script is just a tool to guide the sales force, but it is meant to be improved over time. Just like scripts, email templates can be a great help to salespeople to use what has already worked and rolled it out on a larger scale. It is essential to keep improving those templates to allow sales emails to gain higher and higher conversion rates. Even though templates do work, it is vital to let for at least a small part of it to be personalized. Thus, while you can have a template, you still need to do your research and make sure you offer some valuable information to get the lead interested in what you’re saying. Why would anyone listen to you if you’re sending out the same message to anyone? Before contacting anyone make sure to do your research. People are interested in listening to you when you can deliver to them solutions to their problem. None cares about your product or service or who you are (unless you’re a rockstar). Thus, before sending our that message, are you providing something valuable to the person on the other side? One of the less understood aspects of selling is the fact that you only need to pick up the phone as many times as you can and sell your product. However, while this is a prerequisite, it is not really what makes the difference. When you’re reaching out to someone, you need to understand what motivates them, their value proposition. Marketing usually can deliver a value proposition and make it seen by as many people as possible. But that value proposition will be not tailored. In short, your product or service doesn’t have a single value proposition, but it will have as many as many potential clients exist out there. The salesman has to be able to find the value proposition in the product or service that most suits the potential customer on the other side. That is how you get attention. Among the most misunderstood things about sales is the goal setting process. Many believe that is fine to set reasonable goals. Thus, they won’t shot to the moon but rather be happy with a discrete objective. For instance, they might say, “why don’t we increase sales by 50% this year?” And for many, this is a massive increase. Yet if you are not ambitious enough not only you won’t reach the objective but you won’t even take the necessary actions to get there. In short, to reach massive results, you need to have quite ambitious goals, and targets. Those will ask for the kind of actions that will get you motivated in the long run. If you’re selling to another business, you need to understand its psychology. While indeed when you sell to a consumer, you want to understand their necessities. When it comes to the business, you want to study their business model indeed. How do they make money? Who are their customers? What do their customers want? What cost structure does the business have? All those aspects will be critical to understanding what the person, on the other hand, is motivated by and get you closer to deliver the solution that works best for them. This is the most critical word in sales, yet many neglect it. When you’ve spent hours in prospecting, researching, and meeting a client you’ve done only part of the work. However, when you don’t follow up, you’ve wasted your time. You could have well not done the work at all. The follow-up is probably the thing that requires the least effort (that is more a matter of organization), yet that is what gets you to close the deal. Until the potential client gives you an answer which might be positive or negative, you need to follow-up! In some cases, you might think your pipeline is good enough. That is when you start losing ground. To avoid the risk of being left with an empty pipeline, you need to be prospecting at all time. Some deals might take way longer than expected to be closed, in that scenario you need a backup plan, which is your pipeline and how full it is. When you’ve closed a deal or received a No as the answer, you can’t just leave it up there. You need to keep in touch with that person as what might have prevented to close the deal might have been timing. On the other hand, if you already closed a deal with that person keeping in touch might allow you to understand when that person has additional needs and whether you can help with your company to fulfill them. Many think of selling as closing a deal. While closing is part of the process, you’re selling (or serving) at all time. The common mistake is to think you have to deliver value only when the customer has been acquired and he has given you the credit card. Instead, you need t deliver value as soon as you start interacting with a potential client. Why does she/he need to trust you? That person doesn’t know you, how she can be sure you’re the person she wants to have business with. There is only one way to prove it, to deliver value before the sales are closed. After you’ve closed the sales, it isn’t like your work is over. If you provide a service the most delicate part of it is the first stage of usage of that service by the new customer. Indeed this is still a process in which the person needs to understand whether you can be trusted to deliver the value you promised. Therefore, you need to be on top of it. The way you support the client once she has acquired your product or service determines how much your business can be trusted. Also, an essential part of any sales funnel is the referral side. When you’re providing outstanding support not only you’re retaining valuable customers, but you also have those people refer your business to others. Once that becomes hardwired, it will be much easier to get things going! How Does Google Make Money? It’s Not Just Advertising! Previous Previous post: How Much Is Amazon Advertising Business Worth? How Much Is Amazon Advertising Business Worth?